Northern has received a $100,000 Economic Development Job Training Grant to help set up an aviation maintenance academy for American Eagle at Sawyer International Airport. The company sends new hires to a seven-week training program before they are dispatched to aircraft maintenance facilities across the country. Deborah Ward, a nationally recognized proposal-writing consultant for education and non-profit clients, will present three workshops on Tuesday, Nov. 8, in the Ontario Room of the University Center. Harvey Wallace (HPER) has been appointed to a steering committee representing the National Association of Local Boards of Health. The first university forum of the fall semester will be held from 3-5 p.m. Wednesday, Oct. 26, in the Michigan Room of the University Center. The forum will preview the next legislative budget cycle, in which NMU will continue to face pressure stemming from the per-student funding gap and formula funding proposals, and address the university's response to the rising natural gas and utility costs. Recent improvements to Forest Roberts Theatre might not be visible to audiences, but those who spend most of their time backstage are celebrating the opportunity to work with updated equipment in a safer environment. 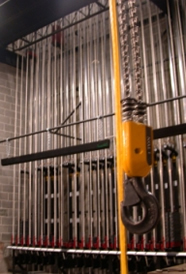 Technical Coordinator Kimberly Hegmegee (CAPS) said a major component of the project was a new rigging and fire curtain system (the rigging is pictured at right with a hoist in the foreground). “They tore out the old rigging and replaced the whole thing, from floor to grid, with a new counterweight system,” she added. “If we would have done Beauty and the Beast with what’s in place now, we could have done the lifts – like the beast transformation – without hiring a professional company. An opening reception for “State of the Digital Art,” an exhibit of computer-generated art by two NMU faculty members and six international artists, will be held from 7-9 p.m. Friday, Oct 21, at the DeVos Art Museum. Friday's NMU-MTU hockey game is sold out, but there is a waiting list of Family Weekend visitors who would like to attend. Faculty and staff who purchased season tickets but are not planning to go to the game are asked to consider donating them to the Athletic Department at ext. 1032. They will be distributed to Family Weekend participants. Mark Paulsen (Chemistry) is a self-proclaimed nerd. “I’ve always loved chemistry – researching it as well as teaching it – and for fun I read things about history and politics," he said. "There’s really no denying my nerd status." Paulsen has been teaching chemistry at NMU for eight years after transferring from a research laboratory at Washington State University. “I enjoyed my job at the lab, but I missed interacting with students, so I applied for this job instead,” he said. NMU employees have pledged $20,000 to the United Way of Marquette County, according to workplace co-chair Ken Godfrey (Athletics and Recreational Sports). That is 57 percent of the $35,000 goal. Faculty and staff who have submitted pledge forms can gain free admission to the NMU vs. Saginaw Valley State football game on Oct. 22 by giving their name at the ticket window. Employees who turn in their completed pledge forms at the gate will also be eligible for free entry to the game. A readers’ theater performance at NMU will feature compelling stories from the new book Voices of Courage: Inspiration from Survivors of Sexual Assault. It was written by a diverse group of 12 individuals – including a former NMU student – who share their personal accounts of survival in their own words.